The foundation of excellent oral hygiene is visiting the dentist two times a year for dental checkups and teeth cleanings. 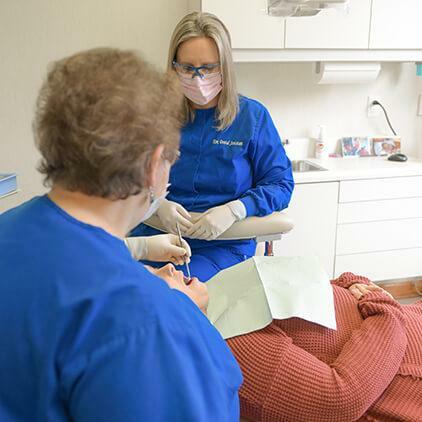 During these regular checkups, Dr. Veronica Walker will carefully examine your smile, one of our skilled hygienists will clean even the hardest to access parts of your teeth, and we’ll work as your partner to create a long term oral health care plan to keep your smile whole and healthy for a lifetime. Contact our team to find out more about general and preventive dentistry services from Dr. Walker and her team or to schedule an appointment at our Kernersville, NC dental office. Every dental checkup at our office is comprised of three main parts: examination, teeth cleaning, and treatment planning. We use digital x-rays to examine the underlying structures of teeth, and complete a thorough visual inspection. During this evaluation, we are screening for signs of common oral health conditions including tooth decay, gum disease, temporomandibular joint (TMJ) dysfunction, teeth grinding and clenching (bruxism) and oral cancer. Once we’ve examined your teeth, we’ll complete your professional teeth cleaning. Even the most thorough at-home hygiene plans can miss parts of patients’ smiles. That’s why it’s so important to receive professional cleanings in addition to your at home care. Our hygienists can also answer any questions you have, recommend at-home hygiene products and help you focus your home care where it is needed most. Following your teeth cleaning, Dr. Walker will sit down with you one-on-one to discuss your current state of oral health and partner with you to plan for ongoing care at home and in our office.